Hyundai have decided to take the mantra of “safety first” to a whole new level. Well, when it comes to you. Their stunt driver? Not so much. In a series of videos called the “Blind Test Drive”, Hyundai people throw a stunt driver into a 2015 Genesis with all the windows blacked out and send him through a marathon of trials and tribulations that put the car’s safety features to the test. The first, called the Gauntlet, tests the reverse camera and Rear Cross-traffic Alert sensors. By having the stuntman drive between swinging shipping containers that could crush him and the car. No biggie. 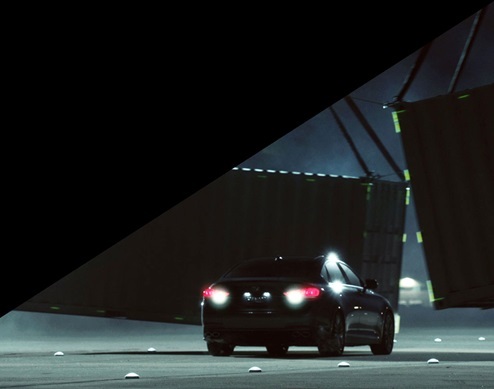 The second shows the driver avoiding military-grade tire spikes with the Genesis’s lane departure warning system, and the third shows off the autonomous emergency braking system by sending the stuntman straight at a parked vehicle. Spoiler: he survives them all. And the Hyundai Genesis doesn’t just come packed in with lane assist systems, emergency braking control, and a rear camera and sensors when it comes to safety features. There’s also blind spot detection and adaptive cruise control. Needless to say, when you buy new cars, you hope they’re all as safe as this. But what’s great is that the 2015 Genesis isn’t just a padded, drivable safe-zone. Hyundai built this all wheel drive vehicle with a goal to challenge the other luxury sedans on the market, and to do so while still costing up to 10,000 dollars less. With a 3.8 litre V6 engine that will provide you with 311 horsepower and 209 lb-ft of torque, the Genesis packs plenty of punch, but if that’s not enough for you, you can always choose to bump it up to a more powerful V8. The car’s rigid suspension keeps vibration to a minimum, so the noise inside the cabin stays relatively low. You can alternate between automatic and manual transmission, or set the automatic to various settings like “Eco”, “Normal”, and, of course, “Sport”. The rest is all icing on the cake. Eighteen-inch alloy wheels, heated front seats, key-less entry, adaptive HID headlights, and a style that exudes simple class. The Genesis is Hyundai’s call to the future. Sleek, safe, luxurious, and for a price that worries the competition. It’s the Genesis of something new. Would your car survive the Hyundai safety test?